Named one of the seven horticultural wonders of the world, along with the redwood forest in Sequoia National Park, Brazil’s tropical jungle in the Amazon Valley, Mexico’s Xochimilco floating gardens, India’s gardens of the Taj Mahal, Japan’s Yokohama rock gardens, and the gardens of Buckingham Palace. 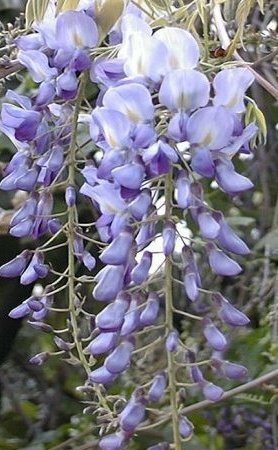 Wistaria is commonly spelled either wistaria or wisteria, but since it was named in 1818 for Caspar Wistar of the University of Pennsylvania to honor his contributions to science, it probably is properly Wistaria. Sierra Madre’s vine was planted by William and Alice Brugman. According to a letter from the Brugman’s daughter, Emily Brugman Childs, it was originally purchased from the old Wilson Nursery in Monrovia in a gallon can for $ .75 in 1894. The vine is of the Chinese lavender variety. It is a member of the pea family, even though its seeds resemble beans (shiny, flat and black). The seeds are said to have been brought to Europe by Marco Polo in the 13th century as prized treasures from the Orient. H.T. Fennel bought the house in 1913, and built extra arbors to support it so it could cover the house. Photographs from the 1930s show that it did just that; eventually the roof collapsed and the house was torn down in 1931. The arbors were retained, and a new house was built 200 feet away. In 1918, 12,000 people attended the first public Wistaria Festival. In the 1930s, a 6-week Wistaria event took place, with more than 100,000 people making the trip to see the vine. Extra “Red Cars” were put on the Pacific Electric route to Sierra Madre to handle the crowds. In the 1940s and again in the 1960s, at considerable expense, the vine required horticultural restoration, dry ice packs, three foot hypodermic needles with Vitamin B, hormone shots and more. Through the years the vine has had many nicknames, among them Glorified Bean, Jack’s Beanstalk, Queen of the San Gabriels, Lavender Lady, Sierra Madre’s Treasure, and the Monster. The Sierra Madre City Council proclaimed 1994 as the Centennial Year of the Wistaria. Video of photos from the 2007 Sierra Madre Wistaria Festival, featuring music by the late Michael Zubia, who performed classical guitar at the vine for several years. Art & Craft Faire: 9:00 a.m. to 5:00 p.m.
WHERE Sierra Madre – East of Pasadena, northwest of Arcadia. Take Foothill freeway (210) to Baldwin Avenue off-ramp; Go north one mile to Sierra Madre Boulevard for Festivities, shuttle buses, information and parking. Shuttle ticket serves as entry ticket, if not riding shuttle, you may view the vine, as well. Shuttle buses (optional; however, walk is one mile uphill, between downtown Sierra Madre and Wistaria Vine). $15/person (+$1.82 fee); Seniors and kids 6 – 16, $7 (+ $1.38 fee), age 5 and under free (price is the same, whether you go one way or round trip, no refunds or exchanges) Day of event tickets, $15. Note: Grounds are on private property; access incompatible for people with limited mobility; call 626-355-5111 for more information. Wheelchairs, strollers not allowed. Tour Groups: Contact the Chamber at 626-355-5111 for procedure. NEW THIS YEAR! Wistaria Auto Show! Art & Craft Faire, up to 150+ juried artisans, 9:00 a.m. to 5:00 p.m.
7 Comments on "Wistaria Festival"
Hi there, does anyone know what artist was displaying/selling metal wall sculptures with a sun/moon motif. I want to buy one of his pieces as a gift. That last time I was there the largest of the 5 or 6 plants was 50 ft from one end to the other at best. This event is nothng more than a money making event for the owners and the city. The ‘facts’ in the article are grossly exaggerated to say the very least. I do admit it is a nice plant to go and see, but definitly over hyped! Actually the owners make no money from it, nor does the City. It’s a Chamber event, not a city event. And the property owners are kind enough to open their property to as many as a couple thousand people in a single day. Since the Chamber hires the buses and charges for the tickets, but it’s free to get in to the vine, how exactly is it that you think the property owners make money? A little gratitude is in order, not cynicism. I would like to be a vendor in your up coming festival March 17.My product are African clothes.Please can you send me the application form or email me at to how I can join? You’ll need to contact the Chamber of Commerce at (626) 355-5111 or by email at info@sierramadrechamber.com. Wistaria is a beautiful flower and this seems like a wonderful festival. We would like to be a vendor in your festival. Can you send us to the application or mail one? Our product is beaded hematite bracelets, beaded Chan Luu Style, with semi-precious stones, Shamballa friendship bracelets, other similar jewelry items. Leather wrap jewelry. Also Beautiful scarves with pendants and/or beads attached.